Securikeyreels.co.uk offers one of the most reliable and widely-used Self-Retracting Key Reel ranges on the market. 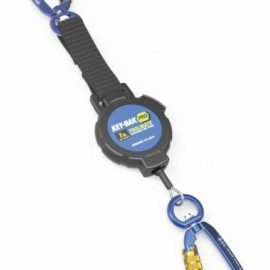 Expertly designed for securing keys, tools and ID badges to belts or clothing, key reels are used by a huge variety of professionals, including couriers, security guards, shopkeepers, building services managers, porters and drivers. Launched over 40 years ago, the range has developed and expanded to meet demand and now features a choice of over 30 models, all of which are ruggedly constructed to provide total peace of mind. Securikey’s Heavy Duty range of Key Reels is designed for the industrial and commercial market, with each model capable of carrying up to 284g. 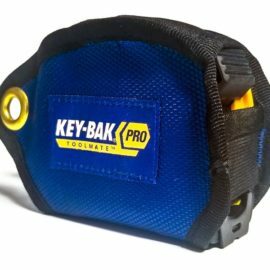 The range includes the best-selling Super 48 models, which feature an extremely durable yet lightweight case made from a polycarbonate material as well as a patented ball-joint feature that secures keys firmly in place. 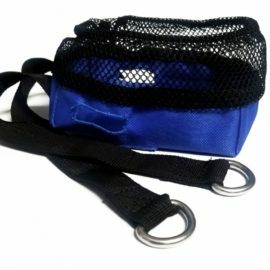 The Super 48 can be attached to belts via a metal spring clip that converts to a belt loop, or a leather loop if preferred. Other models in the Heavy Duty range are manufactured with either an ABS or stainless steel case and offer four methods of attachment to either belts or clothing to cater for most requirements. All models, including the Super 48, incorporate the recognised Kevlar® cord, which is stronger and lighter than steel on an equal-weight basis and offers a smooth, quiet operation. 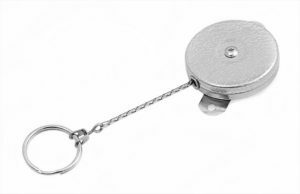 Best suited for light commercial and domestic use, all models in the Standard Duty Key Reel range are housed in either a stainless steel or an ABS case and feature 600mm of stainless steel chain. Perfect for attaching ID or access control cards to belts or lapels, the range offers five methods of fixing including Belt Loop, Spring Clip, Spinner, Karabiner Clip and finally Bracket Mount for securing tools to surfaces. Light Duty models are also available and offer attachment options of either a spring clip or a jewellery pin, with 910mm of nylon cord to ensure ID or access control cards are kept close to hand at all times. This range also offers an own-branding option for corporate clients. Securikeyreels also offers a choice of accessories to complement the Heavy and Standard Duty ranges, further extending the options for customers. These include a key silencer with removable key carrier, key rings and a key chain with trigger snap attachment.